In a recent TV ad, Ammar Campa-Najjar devoted 2 seconds to the issue of California’s gas tax. But it cost the Democrat the financial and manpower support of the California Labor Federation. By saying Campa-Najjar “opposes raising gas tax,” the TV spot attacking indicted rival Rep. Duncan Hunter was too much for the Oakland-based labor group. “While he didn’t mention Prop. 6, that was certainly, to us, a flag that [was] signaling some support for the measure, whether he said Prop. 6 or not,” Labor Federation spokesman Steve Smith said Wednesday. Proposition 6 on the November ballot would repeal Senate Bill 1, which aims via a 12-cents-a-gallon tax hike to improve roads, bridges and other state infrastructure. The state Labor Federation still endorses Campa-Najjar, Smith told Times of San Diego. But it won’t back him with door-knocking, mailers or efforts to inform union members about him. Smith couldn’t put a price tag on that support, but said the decision came after discussions with Campa-Najjar and San Diego’s labor council and Building and Construction Trades Council. Asked for comment, Nick Singer of the Campa-Najjar campaign sent a link to a Rolling Stone magazine interview. 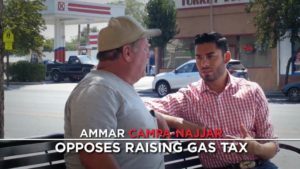 Campa-Najjar has opposed the gas tax since at least August, when the Los Angeles Times detailed how several Democrats were against it. But he hasn’t explicitly backed Prop. 6. That prompted the labor group to urge the dissident Democrats to try a new tack. In the case of Campa-Najjar, trying to woo Republicans in the deeply red 50th Congressional District of East County, the labor group advised a different strategy. “We left those conversations [with Campa-Najjar] that he was going to be talking about infrastructure investment and he was not going to be talking about the gas tax,” Smith said in a phone interview. Smith said his group didn’t cancel its endorsement of Campaign-Najjar, however. They didn’t have the time, “nor really the inclination” to do that. Defeating Prop. 6 is a “top priority” for the Labor Federation, Smith said. On Tuesday, Dan Morain of CALmatters noted that organized labor has spent $17.1 million to defeat Prop. 6.